Heat oven to 350°F. Spray 13 x 9-inch (3-quart) baking dish with cooking spray. 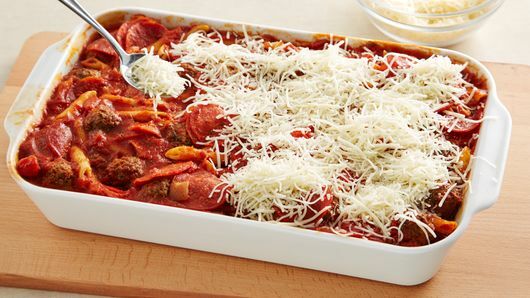 In baking dish, mix all ingredients except cheese; mix well. Cover with foil. Bake 55 to 60 minutes or until pasta is tender. Uncover; sprinkle with cheese. Bake uncovered 8 to 10 minutes or until cheese is melted. To customize this pasta bake, try adding any of your other favorite pizza toppings, such as baby spinach, sliced mushrooms or sliced ripe olives. Any of your favorite marinara or pasta sauces can be substituted for the chunky marinara sauce in this recipe. 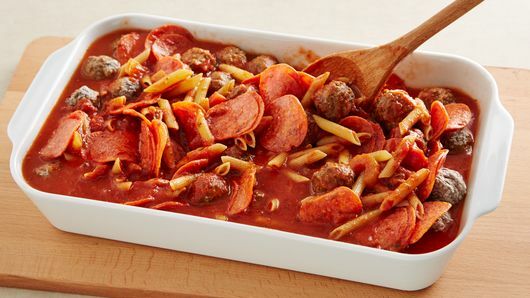 What starts as a basic pasta and meatballs dinner turns into a family-favorite casserole that’s easy to throw together on a weeknight thanks to your 13x9 dish. Speaking of your family, what toppings do they like on their pizza? Add onions, black olives, mushrooms and green peppers to the dish to make it a twist on pizza night. Don’t have meatballs in the freezer? No problem! Try using Italian sausage in lieu of the meatballs. 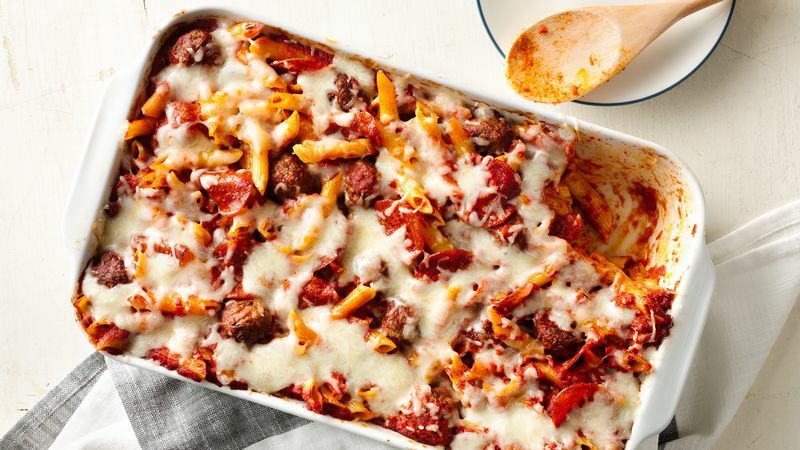 Another twist you could try is to use a jar of marinara and a jar of Alfredo resulting in a creamy penne pasta and meatballs bake. We’ve got more twists where that came from with our endless list of penne pasta recipes.